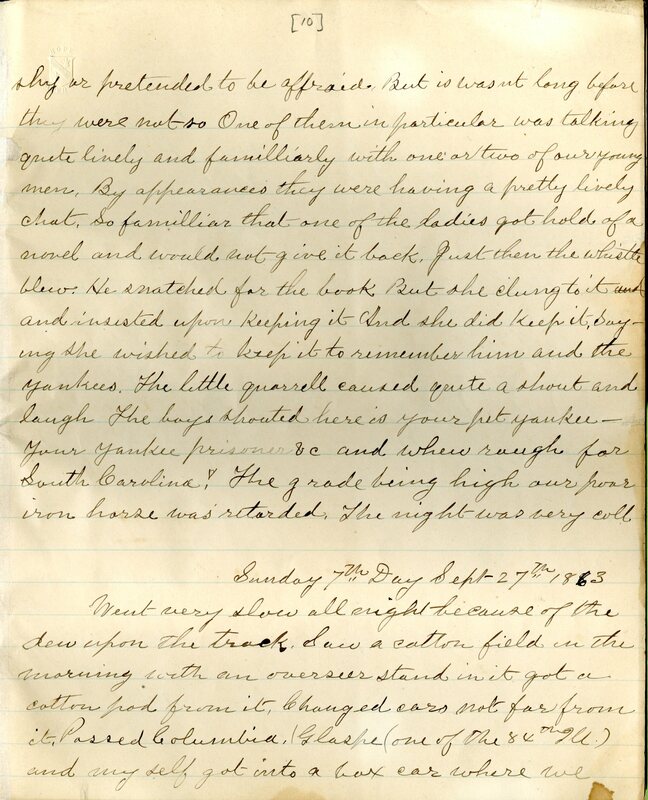 Item description: Diary entry, 26 September 1863, of William H. Tillson of Company E, 84th Illinois Infantry Regiment, United States Army. Tillson was captured by Confederate troops while foraging for water on 21 September 1863, the day after the Battle of Chickamauga. 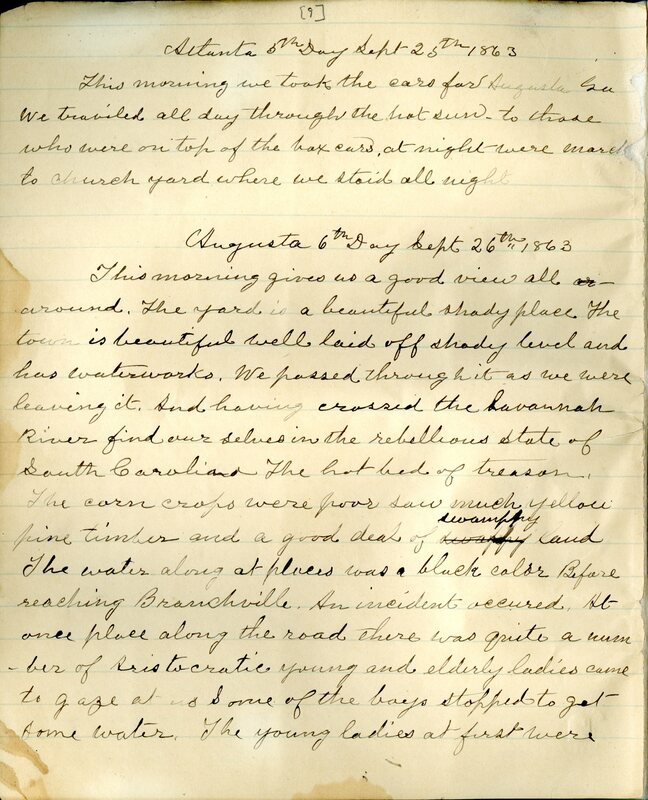 He kept notes during the march from the Chickamauga battlefield to Libby Prison in Richmond, Va., and reconstructed them into a diary sometime after he was exchanged in April 1864. In this entry Tillson described the landscape on the march from Augusta, Ga., and a quarrel between the prisoners and some local women that occurred near Branchville, S.C. Item citation: from the William H. Tillson Diary #5007, Southern Historical Collection, Wilson Library, University of North Carolina at Chapel Hill. This morning gives us a good view all around. The yard is a beautiful shady place. The town is beautiful well laid off shady level and has waterworks. We passed through it as we were leaving it. And having crossed the Savannah River find our selves in the rebellious state of South Carolina The hot bed of treason. The corn crops were poor saw much yellow pine timber and a good deal of swamppy land The water along at places was a black color Before reaching Branchville, an incident occured. At one place along the road there was quite a number of Aristocratic young and elderly ladies came to gaze at us Some of the boys stopped to get some water. The young ladies at first were shy or pretended to be afraid. But it was not long before they were not so One of them in particular was talking quite lively and familliarly with one or two of our young men. By appearances they were having a pretty lively chat. So familliar that one of the ladies got hold of a novel and would not give it back. Just then the whistle blew. He snatched for the book But she clung to it and insisted upon keeping it And she did keep it, Saying she wished to keep it to remember him and the yankees. The little quarrell caused quite a shout and laugh The boys shouted here is your pet yankee–Your yankee prisoner & c and when rough for South Carolina! The grade being high our poor iron horse was retarded. The night was very cold. This entry was posted in Southern Historical Collection and tagged 84th Illinois Infantry Regiment, Augusta GA, Battle of Chickamauga, Branchville SC, prisoners-of-war, William H. Tillson. Bookmark the permalink.